Many people know that the best way to lose weight and get fit is to have a healthy balance of a good diet and consistent exercise. It’s not good for you to skip meals or exercise on an empty stomach, however, so let’s talk about how a healthy diet and exercise work best for successful weight loss. To start, a so-called ‘healthy diet’ does not mean that you’re suddenly limiting yourself to fruits and vegetables, only. There are lots of foods out there that – not only does your body need them to be healthy itself – you should eat to consume the nutrients necessary to energize yourself before or after you exercise. The key to a healthy diet is to focus on the ‘good’ carbs: whole grains, fiber, vegetables, and so on. Here in the Seattle area, we are lucky to have amazing seafood and produce. Fish – particularly salmon – is very good for you, and can help with weight loss. Focus your diet on fewer calories and healthier choices for the ones you consume. Need some examples? Start your meal with a salad – the vegetables will provide you with great nutrients you need, and the dish will help you eat less for your main course. Another example is to choose brown rice instead of white rice. When snacking, go for carrot sticks and hummus before you reach for a bag of chips. The healthier your diet becomes, the better you will feel from the inside, out. Exercise is critical for your health and for weight loss. As you are active, your body uses up energy and calories. As you try to reach your weight loss goals, you should use a balance of cardiovascular exercise in tandem with some weight training. You should try to spend at least 150 minutes each week doing exercises that are moderate (jogging, light cycling, etc. ), or 75 minutes each week doing something more intense. Spread your workouts throughout the week, and maintain consistency to achieve successful weight loss. 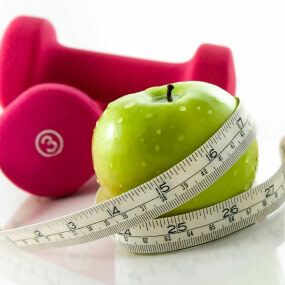 The combination of eating healthier and exercising regularly will make for much better habits. As you consume calories that are better for you, your body will begin using those nutrients to perform better – both as you work out and as you go about your day-to-day activities. Our smoothie bar is open and ready for business! With spring upon us, and summer on its way, smoothies are an excellent way to stock up on the nutrients you need to supplement your training through the warmer months. 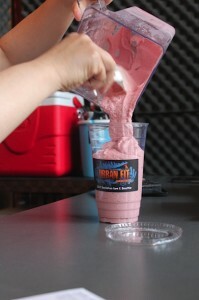 Pouring our Strawberry Banana Oat smoothie. At Urban-Fit, we’re focused on helping you get fit the right way, strength training and conditioning with diverse exercises, nutrition, and safety. Our smoothies are all-natural, made with the best ingredients and without syrups and artificial flavoring that you might find in other smoothies. Most of Urban-Fit’s smoothies fall under three categories: Keepin’ Lean, Get Skinny, or Bulk Up. With flavors like PB & J or Strawberry Banana, you can supplement your workouts to stay fit, maintain trim muscles, and keep lean. Slim down with Skinny Blackberry, Banana, Mango, or Tropical Passion flavors – again, all natural ingredients to help you Get Skinny (we also have a “Get Your Skinny On” special on Fridays, so visit us any Friday for a discount!). If you’re trying to Bulk Up for more muscle mass, finish off your strength-training regimen for the day with our Strawberry Banana Oat or Double Paradise smoothies. We also make delicious Protein Waffles for more bulking up options. Doesn’t our Tropical Passion smoothie look delicious? Orange Creamsicle: We make this smoothie in the ‘skinny’ version – no sugar, syrups, or artificial ingredients. Enjoy the delicious taste of orange and cream as you work off those extra pounds and get trim! Coco-Nutty: Are you nuts for coconut? This smoothie is probably for you. Packed with coconut, almond, and chai, the Coco-Nutty smoothie is a drink for both enjoyment and a supplement to your training regimen. The Greens: Veggies and greens are generally great for your health and diet – particularly nutrient-packed ones like kale and spinach. We’ve flavored this smoothie with those two nourishing ingredients, plus apple to naturally sweeten it up a touch. 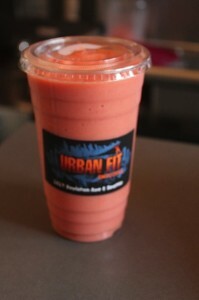 Smoothies at the Urban-Fit drink bar range in price from $4.25 to $5. The smoothie bar is open Monday through Friday from 11:30 a.m. to about 6:30 p.m., and 11 a.m. to 3 p.m. on Saturdays. It is closed Sundays.